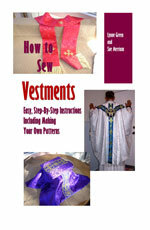 How much fabric do I need to make a deacon's stole? Because it hangs across both the front and the back and has two pieces that hang down, a deacon' s stole takes more fabric than a standard Gothic stole does. If you are using 62" wide fabric, such as the type we sell, then you will need a yard and a half of fabric.